Join the discussion on our forums! 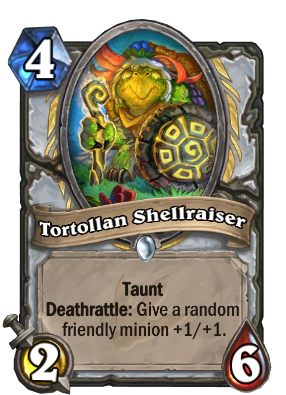 Come discuss Tortollan Shellraiser over in our dedicated Tortollan Shellraiser discussion topic. Sounds like 50 year old feminist. Anyone realized that this card & Stegodon share everything... except the Deathrattle effect... and this is still at Common? Well, Stegodon is a Beast. And this one is a class card. Hate to be the one to tell you but wrong card.. This is the consolation prize for Dragon Priest...sort of similar to Twilight Guardian and Frost Wyrm Agent - the dragon activation stuff. Solid. Probably will work into the new dragon meta for now. The best card of the stream. "Tort'dingo! He he he he!" this is strong. it has synergy with the quest. and it has taunt which is good vs aggro. you can even buff this to make a bigger taunt. 1-1 buff isnt that great but still a bonus effect. Still, a 2/6 taunt is something that can trade a fireball. But keep in mind that most likely, for a priest, keeping another minion alive before turn four is not hard. And the taunt of this card helps ensure that the deathrattle goes off on a minion behind it. basically jsut an enabler for the Priest quest and the viability of standard N'zoth Priest overall. Might even help making Kazakus-N'zoth Priest a thing....the deathrattle just seems kinda tacked on with no real meanin other than "this needs to be a deathrattle card for synergy reasons so let#s throw in a generic deathrattle. A decent card, not OP. Obvious synergy with the Quest. And perhaps another Deathrattle choice at the 4-spot if you're still playing a Reno-style deck. The Deathrattle ability is more likely to trigger since the Taunt means that this minion will probably die before any other minions you have in play that will benefit from this. Replaces the 4 drops of priest that rotate out. Quite a boring card.